It is day one of my trip to TechEd, and at the moment I’m waiting in downtown Providence for my bus to Boston. Normally I would have just caught a flight direct to Boston, but Kristin is flying out next weekend for a few days vacation. We used a free flight on Southwest for her, so booked them as well so we could return together. Unfortunately the MBTA line doesn’t extend to the airport yet, so I had to take a shuttle from PVD to the Kennedy Plaza where I will catch a bus to South Station in Boston. Then I hop on the T over to my hotel. 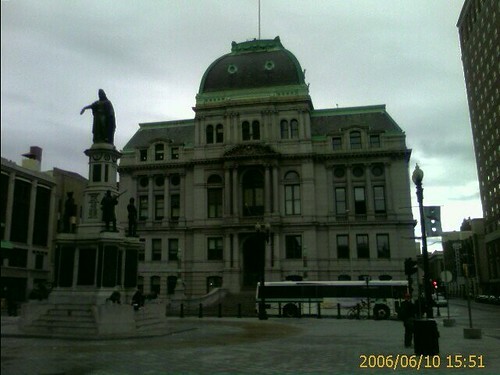 The photo is of City Hall in downtown Providence.